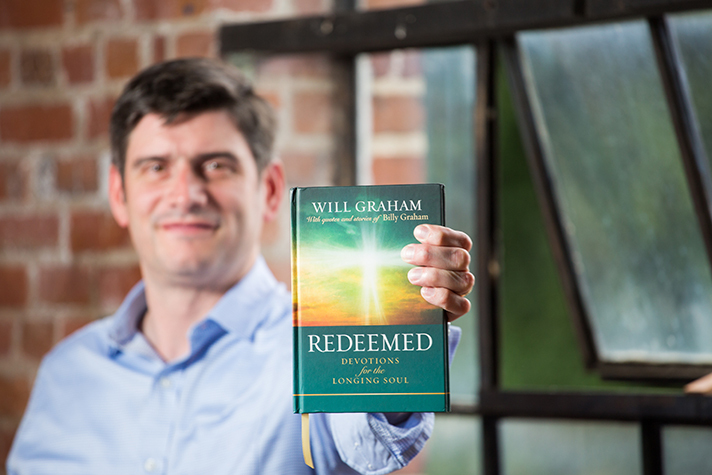 Will Graham dedicated his first-ever book, Redeemed: Devotions for the Longing Soul to his grandfather. In Redeemed, Will wrote: "To my grandfather, Billy Graham, who 'changed addresses' shortly after I finished writing this book." Billy Graham went to his heavenly home on Feb. 21, 2018. That’s what Will Graham calls the anecdotes in his first book, Redeemed: Devotions for the Longing Soul. “I’m excited about it because I get to share some personal stories,” Will said. There are stories of his grandfather, “Daddy Bill”—known to the world as Billy Graham—his grandmother, Ruth Graham, and his own experiences. Redeemed officially released Oct. 23. 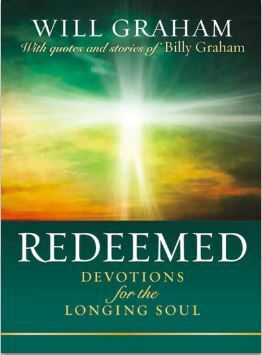 Will Graham’s first book, Redeemed: Devotions for the Longing Soul, includes quotes and stories from his grandfather, Billy Graham. The book also includes quotes from Billy Graham, family and ministry photos, Will’s teaching, a prayer and a question to challenge readers. All 50 entries are centered on the life-changing power of a relationship with God. Will earnestly wants people to hear God’s message of love and redemption. In traveling to six continents to hold evangelistic outreaches, he’s seen broken people turn their lives around by pursuing a personal relationship with Christ. The evangelist is excited for new opportunities to share the Gospel in 2018. Besides writing a book, he also portrayed his grandfather in the movie Unbroken: Path to Redemption, a sequel to the 2014 Unbroken film. In theaters now, the film shows how God transformed the life of Olympian and World War II hero Louis Zamperini at a Billy Graham Crusade. “I’m trying to use, just like my granddaddy used, all these different communication means to proclaim the Good News of Jesus Christ,” Will said. In addition to his evangelistic outreaches, Will also serves as vice president of the Billy Graham Evangelistic Association and as executive director of the Billy Graham Training Center at The Cove in Asheville, North Carolina. Do you long for hope? Find it here.